Borzoi also called the Russian wolfhound, is a breed of domestic dog. Descended from dogs brought to Russia from central Asian countries, it is similar in shape to a greyhound, and is also a member of the sighthound family. The borzoi is a quiet, but athletic and independent dog. Most borzois are almost silent, barking only very rarely. They do not have strong territorial drives and cannot be relied on to raise the alarm upon sighting a human intruder. Borzois are large Russian sighthounds that resemble some central Asian breeds such as the Afghan hound, Saluki, and the Kyrgyz Taigan. 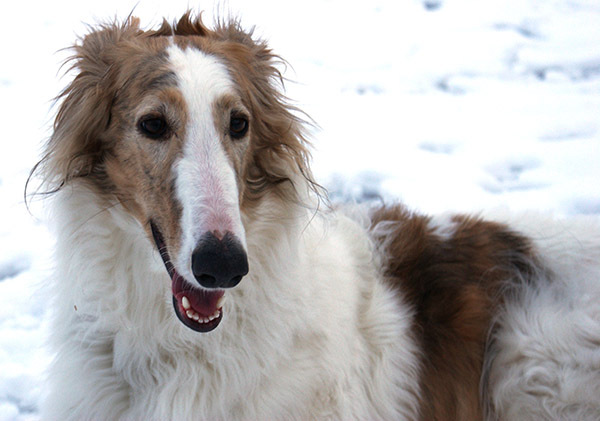 Borzois can generally be described as “long-haired greyhounds”. Borzois come in virtually any colour. 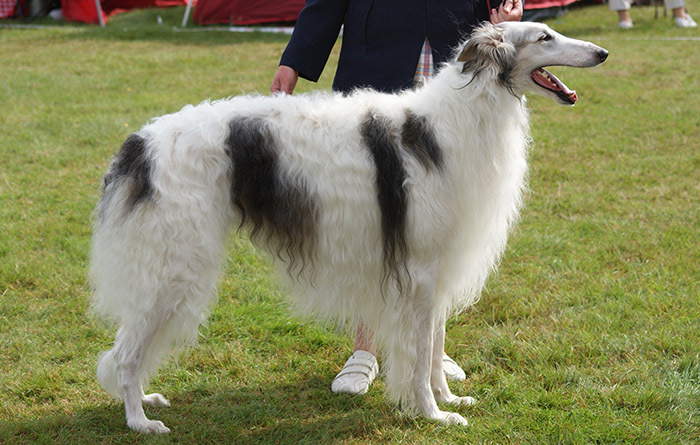 The borzoi coat is silky and flat, often wavy or slightly curly. The long top-coat is quite flat, with varying degrees of waviness or curling. The soft undercoat thickens during winter or in cold climates, but is shed in hot weather to prevent overheating. Borzoi males frequently weigh more than 100 pounds (45 kg). Males stand at least 30 inches (76 cm) at the shoulder, while the height of females is around 26 inches (66 cm). Despite their size, the overall impression is of streamlining and grace, with a curvy shapeliness and compact strength.